Mr Alexander’s unique trailer stage creates the vintage atmosphere that perfectly complements his show and allows everyone a great view. His shows include magic, music, juggling, unicycling, balance and illusion and, on occasions, a spectacular fire routine. Each show is closely choreographed to vintage jazz, transporting the audience back in time to the days of Vaudeville and Music Hall. Many of his routines have developed from live improvisation and eventually, once they have earned a place in the show proper, they become classics of skilled performance, enjoyed and admired by adults and children alike. Mr Alexander’s accompanist, Martin Orbidans, adds live music to the mix. Read all about Martin here. Performances after dark are possible as the stage is well lit. These can also include film presentation, subject to licensing arrangements, or vintage, license-free silent classics. Mr Alexander can also screen an award-winning documentary, made by Rhys Edwards, all about his life as a travelling entertainer and recount hilarious tales of his extraordinary life on the road in Britain today. 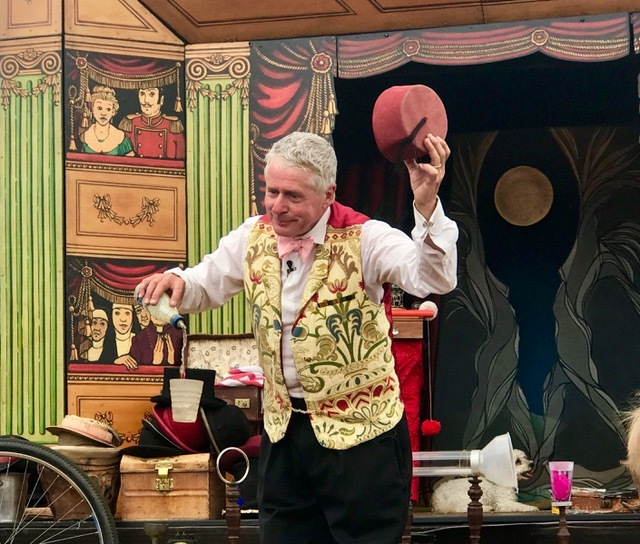 Where space or budget is tight, Mr Alexander can use any surroundings as a stage, weaving between the audience or around tables to present close up performances involving magic and juggling, performing to very small groups or individuals. The entertaining Great British eccentric character of Mr Alexander is maintained throughout the experience and includes close up routines too small for the cabaret or stage shows. He also becomes Verity V, a floating burlesque dancer who drifts through audiences and spaces, performing close up magic to small groups and individuals, moving in and around the audience, challenging perceptions of gender definition with mime, poetry and movement. Another popular mix and mingle character is Toulouse Lautrec, the famous diminutive French painter, who drifts around on his artist’s materials box and jokes about Brexit, the French Revolution and garlic. Mr Alexander’s cabaret show contains many of the elements of his stage show, but can be presented in different environments, times of day or year. The show can be adapted easily to different audiences: children, family/mixed or adult-only. The space required is also flexible - he can adapt to small or large spaces easily and the length of the show can be changed to suit the particular occasion.